We’re not quite sure who is doing the math over a Apple, but someone appears to need go back to accounting school to figure out some of their numbers. During the Apple press conference on Wednesday of this week, when it came time to discuss the iPod Touch, Apple CEO Steve Jobs said that the iPod Touch was the number one handheld gaming device on the market, out selling the Nintendo and Sony handheld devices combined. We’re sorry, but we think that is very much a stretch of the truth. This argument all has to do with semantics. 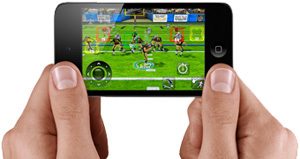 Mr. Jobs pointed out that 1.2 billion gaming and entertainment apps have been downloaded, and that makes the iPod Touch the number one selling mobile gaming device. Okay, yeah, all of the iPod Touch units sold have the potential of playing games, but that doesn’t mean they are. It could be that person A has downloaded ten games, and then person B sitting next to them hasn’t downloaded any. Does that mean that person B’s iPod Touch is counted as a gaming device just because it has the potential of being one? That is a disingenuous concept at best. Just because something has the potential to be something, it doesn’t mean that it is. When someone buys one of the various Nintendo DS handheld units, they know they are buying a game machine. End of story. Some people buy the iPod Touch just to use the Internet in a convenient mobile format, watch movies, play music and so on, and they may never even download one game. In this case the Nintendo wins. Now, if someone downloads one free game to the iPod Touch, does that turn it into a gaming machine? I guess if you’re Apple it does. Like I said it’s all a matter of semantics and definitions, but it just feels like Apple was on the verge of lying with its claim, but not quite. What say you? Was Jobs right?